The following diary was written by Lt Col Brett Dolnick chronicling his adventures transporting a brand new C-182 G1000 from the Cessna Factory in Wichita Kansas to Concord CA. Lt Col Dolnick was accompanied by Capt Jeff Ironfield. Our time at Cessna is just about up and today was a wonderful way to wrap things. We started the day the way it should be done, with a nice flight with lots of failures (simulated, of course). There was no ground school today, so when we got to the factory, we jumped right into our briefings with our instructors. For me, we were going to simulate an MFD, PFD, and ADC/AHRS failure and since I'm a REAL glutton for punishment, I asked if we could do a DME Arc. Sure, we can do that! And hand-fly it too! It was then off to the Delivery building for our preflight. Once we got our tow out, we were off starting with a short-field landing. For those following along on your flight simulators, KIDP to KCNU for the GPS 36 with a low approach. During this approach we simulated an MFD failure. 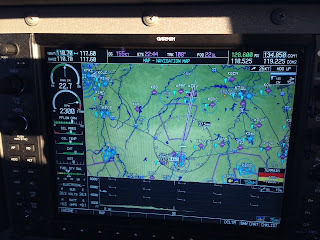 We were then off to KCFV for the VOR/DME-A. Once the autopilot had guided us onto the arc, oops, the PFD failed. Unfortunately, with that comes a loss of the autopilot (along with a few other things). So, it was a nice hand flown arc and then approach with a circle to land for a short field landing. 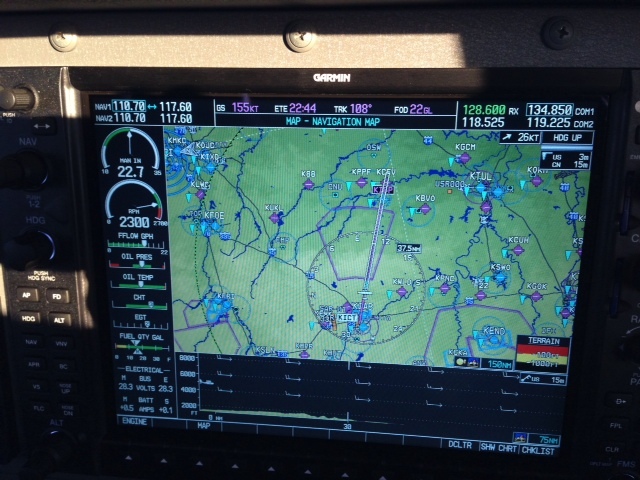 After a soft field takeoff, we flew to Bartlesville where I shot the KBVO GPS 17 with a failed ADC/AHRS. Fun stuff! Jeff dropped our new plane, 183CP off for an oil change, so he flew back to Independence with me and my instructor. Then we went to lunch with the Administrative Assistant for the Flight Training department. After lunch she gave us an amazing factory tour. She knows so much about how everything works she could easily the running the place! The Corvalis line is just starting at this factory and we got to see the first few on the line. They look significantly different from everything else on the floor since it's composite and everything else is metal. The fuselage and wings are brought in as whole pieces and the fuselage is placed right on top of the wing, which is one single piece. The first new Corvalis is about ready to roll out to the paint shop and may even be there by Monday. We got to see everything from the wing skins being formed onto the spars, the insides of the wing being sealed, to the cockpits being built from just a bulkhead, the wiring, cables, fuel lines, etc being added, to the controls being installed. We got to see the interior shop where they were hand making seats (they were doing a back bench for a 182) when we were there, sewing leather, stretching leather onto a new yoke, and making plastic panels for doors and other interior parts. Boy, I wish I could have snuck out some new stuff for my plane! Then we got to see them mate wings to fuselages. While there, they put the right wing on a 172. It took 5 people to lift the wing and hold it in place while another lined it up and another got all the tubes, cables, and wires into the right holes. They got a stand under the wing to hold it while they then riveted it into place. We then went to see the planes when they just come out of paint and having the engine hung. They have Mustangs and many high-wing planes. Did you know that red spinners denote planes still undergoing flight testing? And they don't install most of the interior (carpet, nice seats, etc) until they're ready to deliver the plane. Then we went back to the factory floor where we got to see them make Mustangs. It was similar to the high-wing build. Except bigger! They build the wins and then mate them with each other to form a single piece wing. They build the tailcone, empennage, and nose separately and then mate the three pieces. When we got there Monday, the first Mustang 2 was in three pieces and ready to be mated. Today, it was all together and in he next step, ready to be joined with the wing. Needless to say, seeing the first new Corvalis and first new Mustang 2 being built was pretty cool. And it's amazing the amount of handmade work that goes into the planes. The pride they have here is amazing! After this, Jeff and I made a nice cross country flight to Wichita. I flew there under the hood and shot the KICT GPS 1R. We went to Yingling Aviation to the gift shop. The airport is pretty busy, being Cessna's home and the Citation factory, Lear Jet factory, and an air carrier airport. After getting some gear, Jeff flew the leg back under the hood and shot the KIDP GPS 17. Then back to the B&B for flight planning. Tomorrow morning we will take final delivery of our new plane and head back. The plan is for a stop in Dalhart, TX and then an overnight stop in Prescott, AZ. More to come tomorrow night!